Look What We Found: It's National Thrift Store Day! You are here: Home / Thrift Talk / Thrift Haul / Look What We Found: It’s National Thrift Store Day! Last week, I posted my latest thrift haul from my favorite thrift store and invited you guys to share your latest (or most favorite!) thrift haul with me, as well. Every week I will be featuring the amazing stuff that we all find in my new weekly series call Thrift & Tell Thursdays. And while today isn’t Thursday (it’s Wednesday! ), I couldn’t not post today. I mean…..NATIONAL THRIFT STORE DAY! What a way to honor our love of thrift stores and thrift hauls by showing all the amazing stuff that everyone’s been finding, right?! I can’t possibly buy everything, either (you do know that I once had a faux-hoarding problem, right??). 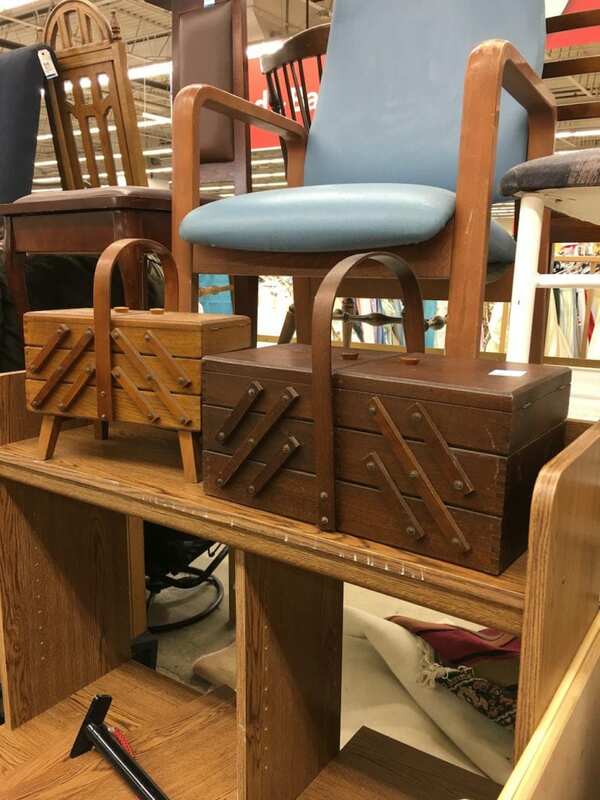 Seeing the awesome stuff that you find, too, will satisfy my “thrift itch” and hopefully will satisfy yours, as well. But I do caution you….This post may cause you to drop the keyboard and run to your nearest thrift store! After all, it is National Thrift Store Day! Don’t say I didn’t warn you…..
Because I reeeeaaallly want to convert my garage into a workshop, I have been limiting myself from buying a lot of furniture from the thrift store. But recently I was walking past this desk at the ReStore and–I’m sorry–it kept calling me. 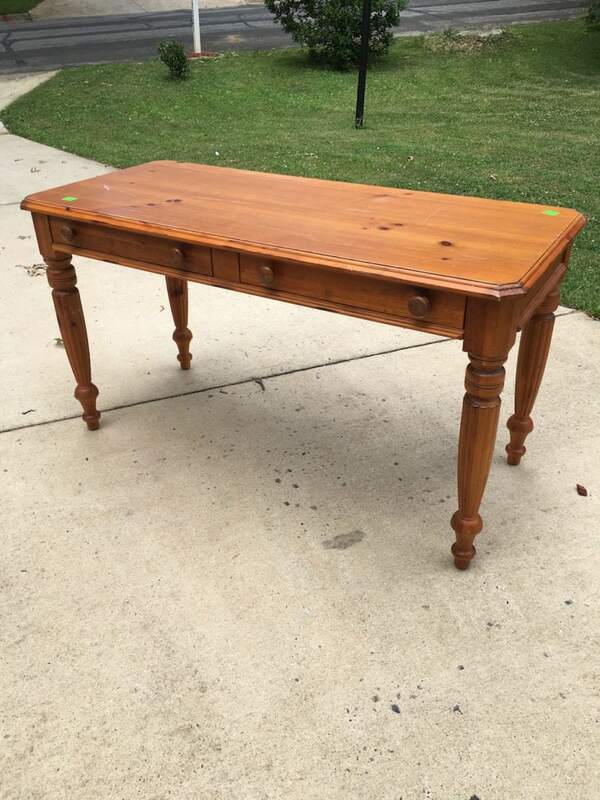 It wasn’t fancy and ornate…it wasn’t antique…just a nice ‘ole solid desk from probably the early 80’s. It was $40, and if you shop at the ReStore, you know that’s a steal. So I bought it! I’m debating on whether I should paint it or keep it natural and just change the knobs? I’d love to actually strip and restain it, but those legs…….all those nooks and crannies….those legs will leave me ripping my hair out. Trust me. Been there, done that! Sometimes you just see the perfect little treasure that you have to buy it because it’s so unique. 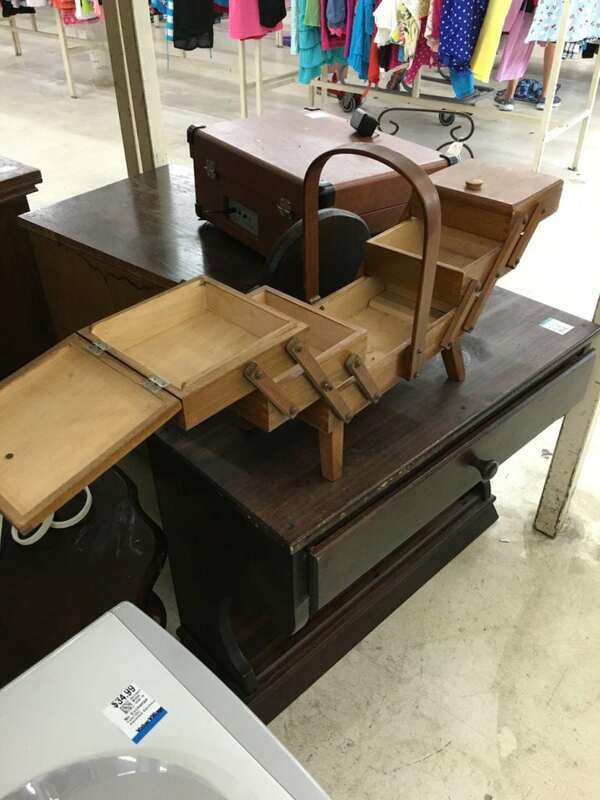 I know that everyone and their Auntie had little sewing boxes like this, but I had never seen them. And since this doesn’t take up much space (read: I’m justifying why it was okay to buy, LOL! ), I knew that I had to buy it. Plus, for only $6.00, why wouldn’t I?? The larger one was in worse condition, so I just bought the cute smaller one and will likely use it for nuts, bolts, and small DIY odds and ends. But someone had a great idea: paint it bright colors and create a LEGO storage box to use while on-the-go with the kids! Don’t you love that idea?!? 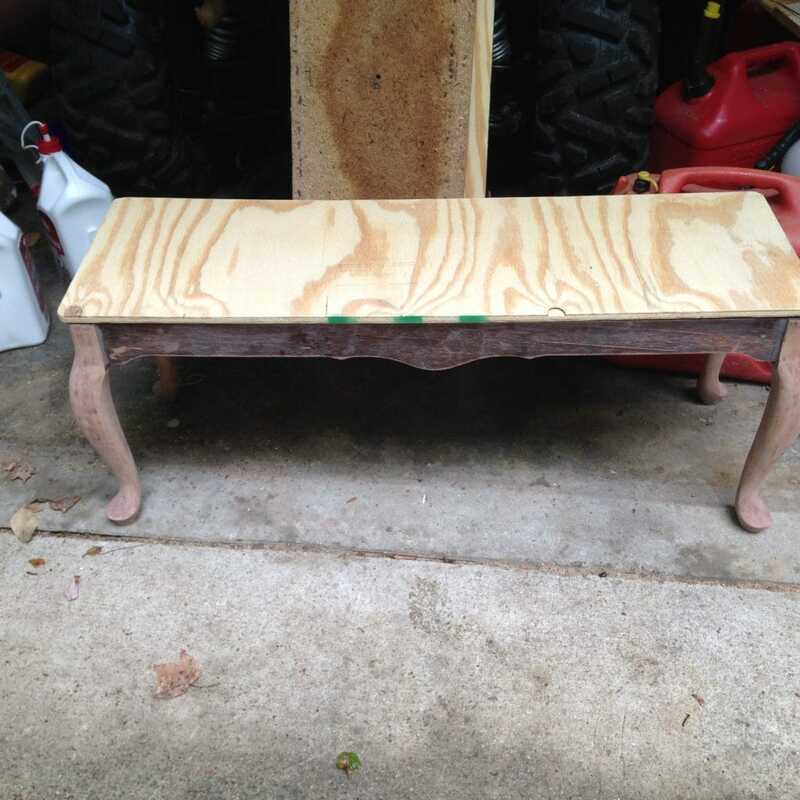 I couldn’t believe that Eileen had found this bench for $5.00! And you’ll want to take note of her use of steel wool! I discovered a few months ago the magical power of steel wool over paint. It shines like no other! In fact, I’ve been meaning to do a post on it! But you can see in my mid-century modern chair makeover how transformational steel wool is! 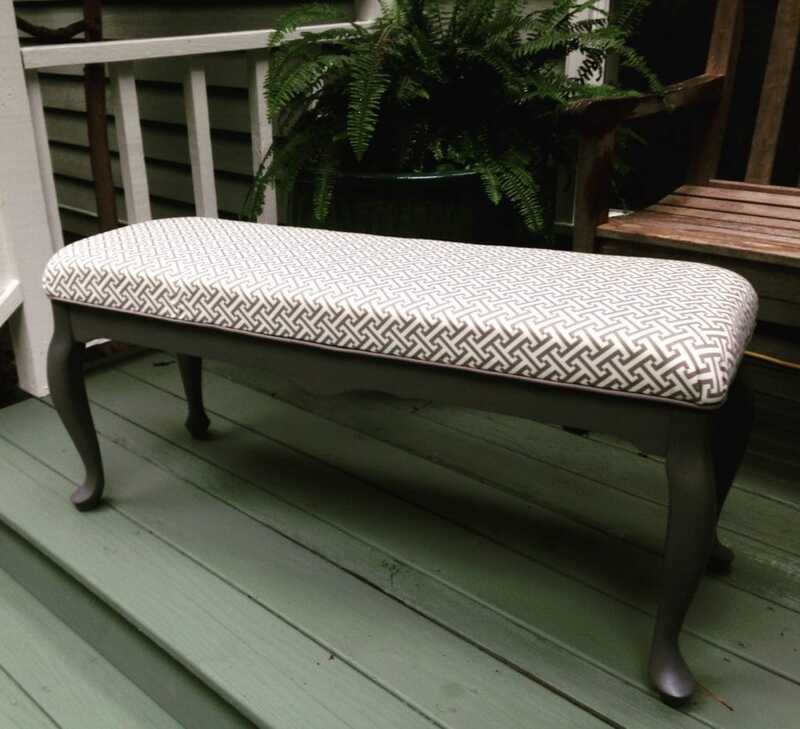 Anyhow, Eileen did a great job on her thrifted bench makeover! See how magical the transformation is? 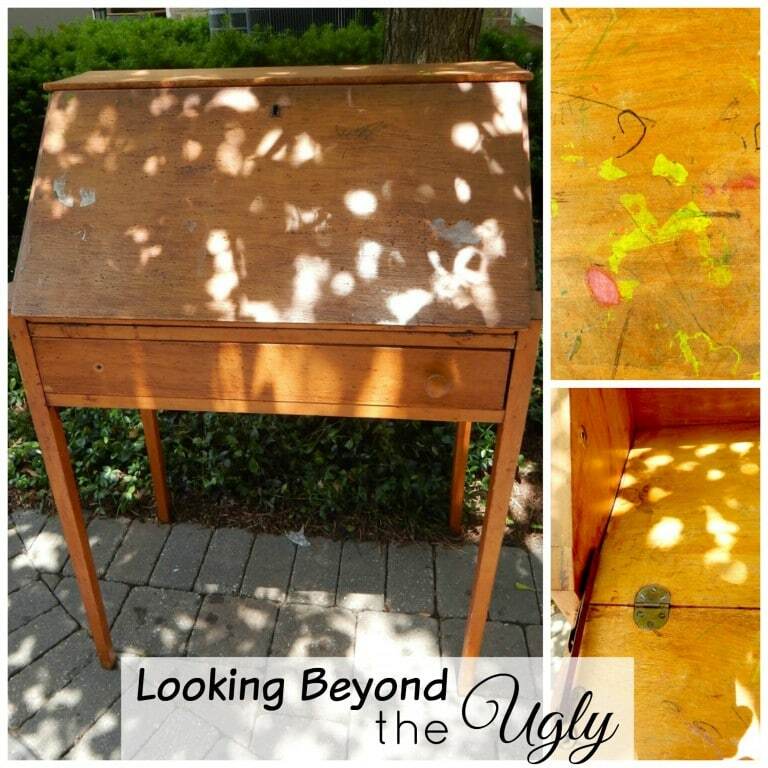 Kathy from StylishRevamp.com sent me this picture of this really cute, but “ugly” desk that badly needed a makeover. I love that she restored it by sanding and staining and didn’t use paint. As much as I love paint, I have to totally agree with her! There’s nothing like the beauty of fresh stain on sanded wood, especially when it had been so badly marred. The truth is that not everything should be painted ( as I mentioned in one of my popular articles What Should You NOT Paint Wood?). It’s okay to not paint wood, and this is one project I am glad wasn’t painted. It looks awesome, doesn’t it? One of the greatest joys of blogging is to inspire people to be creative. 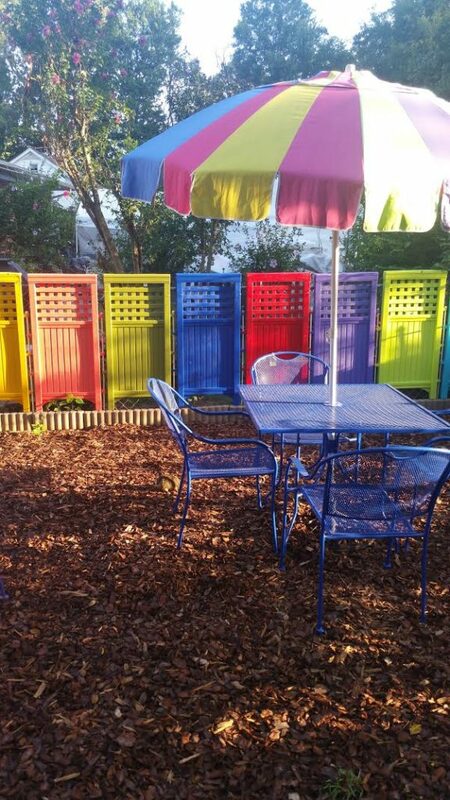 It’s my mission, my “life blood.” So when Margaret emailed me this colorful picture of her backyard and told me that my patio makeover reveal had inspired her to do hers, it made me so happy! 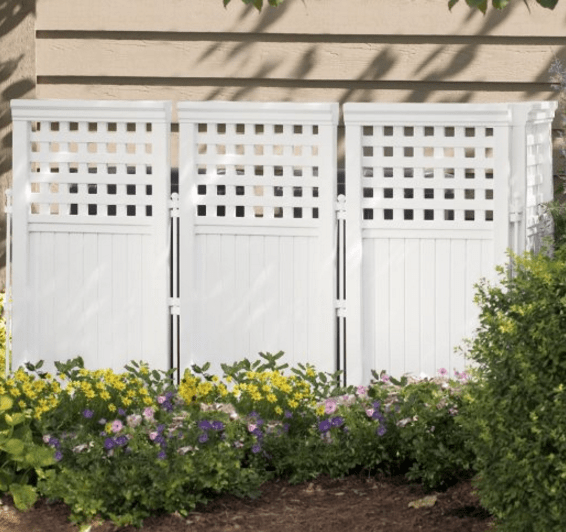 But what’s even more cool is that she created a colorful fence using garage can lattice surrounds that she’s found for dirty cheap!! 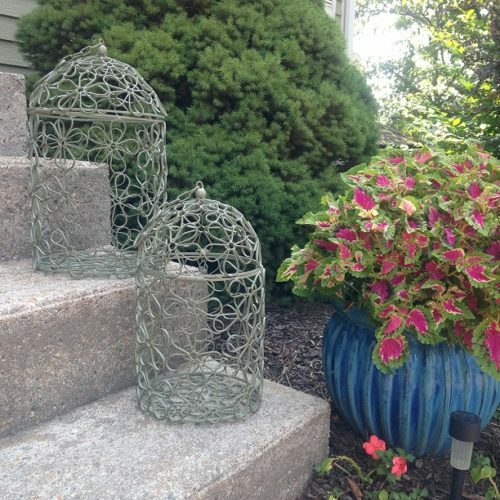 After emailing her, I had to do my own research, and sure enough, I was able to find these garbage can lattice screens that come in sets of 4. And she wasn’t lying! The cheapest I could find them on Amazon were about $75! And that’s for FOUR……. 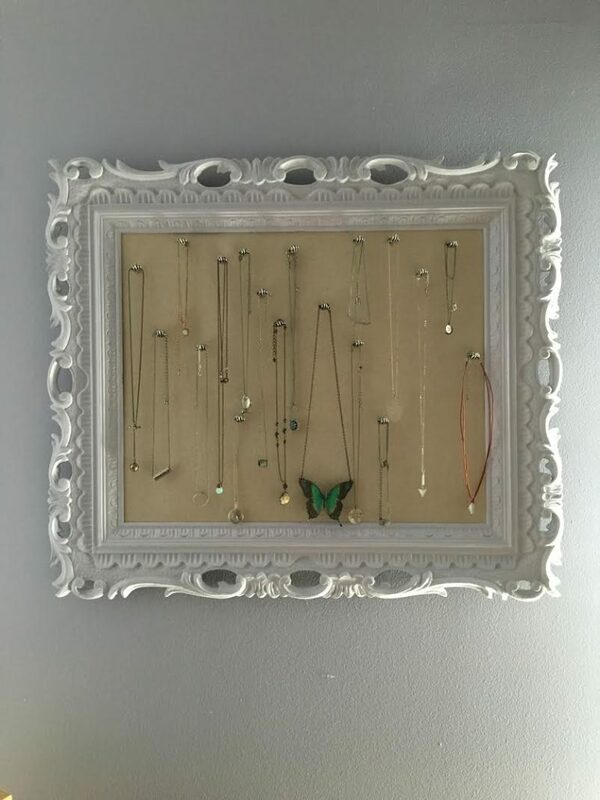 The fact that she found EIGHT for only $5.00….this woman knows when it’s wise to “thrift and store” until inspiration strikes! You can’t pass up a deal like that!!! Here you can see a little more of the built-in display case. This actually inspires me to pull out some thrifted display cases that I had found but could never figure out what to do with them. Maybe make a coffee table out of them! 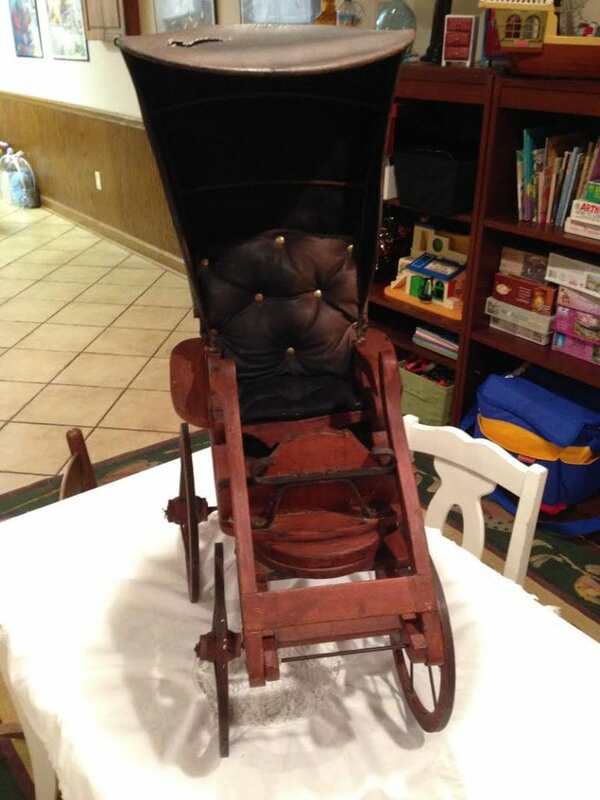 Hmmmmm………..
It’s not every day you find a buggy at the thrift store! Someone hand-crafted it and along the way, it was disgarded and left at some thrift store, just waiting for Claudia to snag it! Right now she’s trying to decide where to put it. You see, my friends….this is why I absolutely love paint. 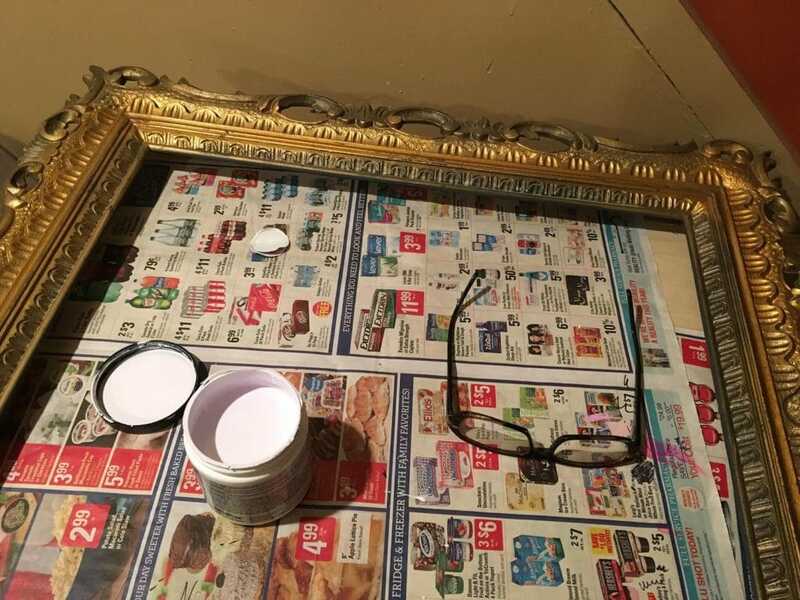 What started as a tarnished-looking frame that was passed over by its original owner, has now become a beautiful piece of art itself! 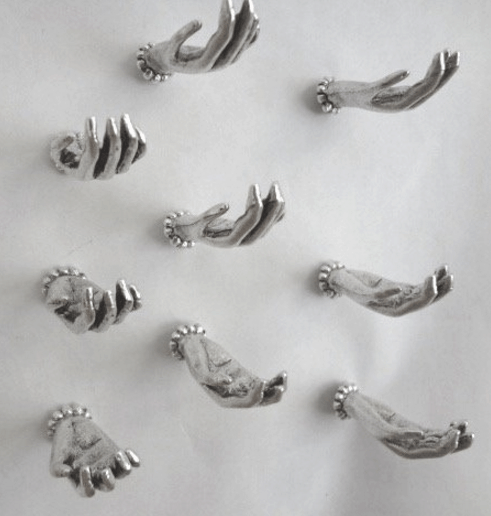 And you can’t see the close-up of Llima’s project, but these are the decorative push-pin hands that she used for hanging her necklaces. OMG, LOOOOOVVVVEEEE!! You can buy them here on Amazon. I want!!!! It’s her project so darling and dainty? LOL As feminine as I am not most times, I do love feminine things, and this is something I could see in a gorgeous baby pink walk-in closet hanging on the wall. Of course, I would definitely steal her idea and use the pretty decorative hand pins, too! Ahhhh….a girl can only imagine, right? Elizabeth was so excited to find four of these cottom doilies! Her first thought was to use it for a little girl’s overdress, but her mom had a great idea: curtains! I think they would look awesome as curtains! 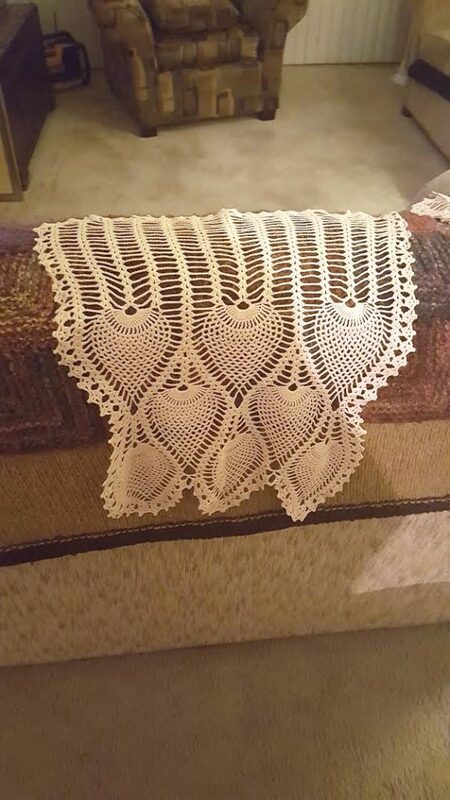 I searched Pinterest for “cotton doilies” and saw a bunch of creative ideas she could come up with for them. Great find! Well, it was Theresa’s lucky day at the thrift store. She found these beauties for only $7.99! 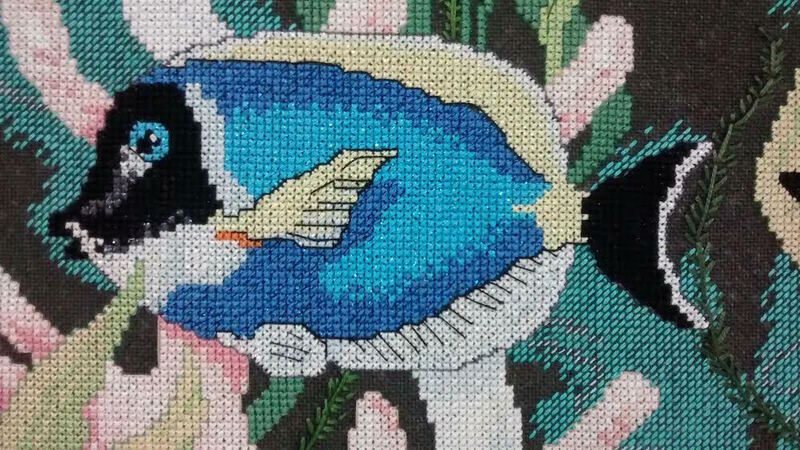 I recently took Kojo (my 4-year-old) to the Aquarium for the first time, and both of our faces lit up at the site of all the amazing designs, colors, and unique looks of the fish and sea life! So when Theresa emailed me these pics, I knew she’s found something special! I’m getting an image in my mind of her Olympic-quality sprint, and I’m laughing a little bit inside, because I know that same sprint! That joy of finding something so truly unexpected and wonderful. What shame for someone to get rid of it, but what a treat for Theresa!! Everyone found such great stuff! I’ll be a little busy over the next two weeks because I’ve got an exciting new project coming up that I can’t wait to tell you about so I probably won’t be able to hit the thrift stores this week. However, I would love for you to share with me anything cool that you find over the next couple of weeks! If you do a project makeover, go ahead and email me your BEFORE & AFTER pictures so I can show it off to everyone! So what’s your favorite find above? And how are you planning to celebrate National Thrift Store Day? 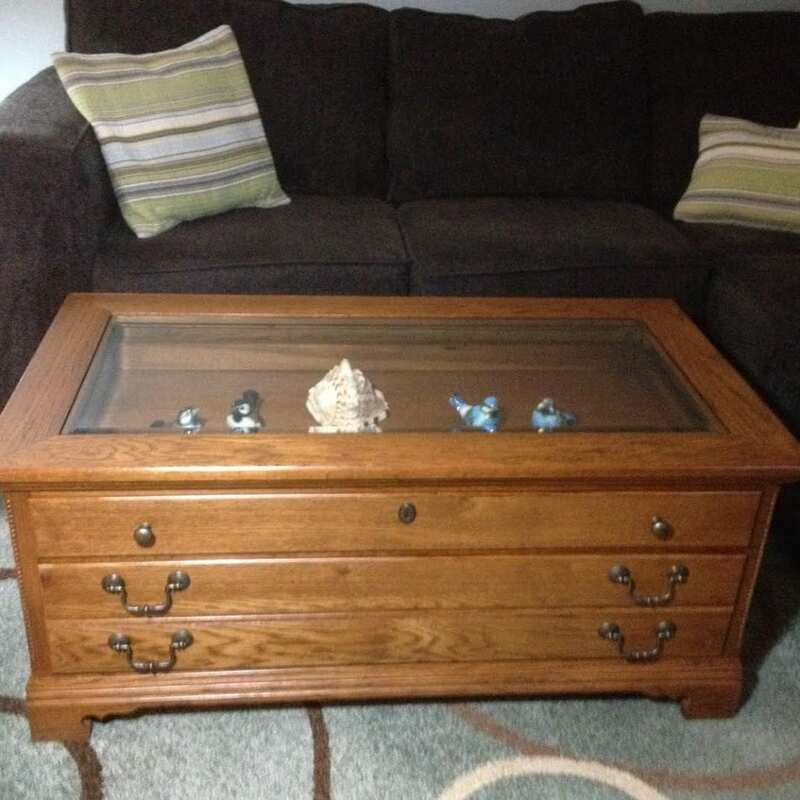 « I Upcycled an Old Crib Into a DIY Coffee Table! I hope you do not paint the solid wood desk you found. It is beautiful and worth the effort it would take to refinish it. It wouldn’t be nearly as hard to strip as the 100 year old piano I worked on years ago. Hi, Brenda! I’m thinking I might paint the body and refinish the top, though. The color of the wood is a little dated and doesn’t match anything in my house. Decisions, decisions! And OMG, you refinished a 100 year old piano?! I’d love to see pictures of that!! How long did it take you? At 12:30 PM I read your email and immediately called two friends with the news that it was National Thrift Shop day, so we immediately hit the road. Living in a small town, we hit a town at 20 miles away & visited 2 thrift shops. Then we went to another town about 30 miles away from the first and hit 2 more. I was very surprised that none of the staff at the four thrift shops knew that it was National Thrift Shop Day. We had a ball and got some good buys. Thanks for information. I subscribe to your blog and enjoy it very much – not only interesting but full of information. fell apart so when moving I got rid of it. I really like the bench that Ellen redid. good color choice . Kathy did a good job on the desk. But my favorite is the privacy fence and table. Love the colors Margaret. These posts give me so much inspiration, I have to find something to do. I didn’t know it was National Thrift Store day, but I did celebrate in the spirit– I went by two today. LOL I’m awed by everyone’s finds so far. That bench is amazing, it looks like something out of a decorator’s room. And that refinished dropleaf desk… *swoon. 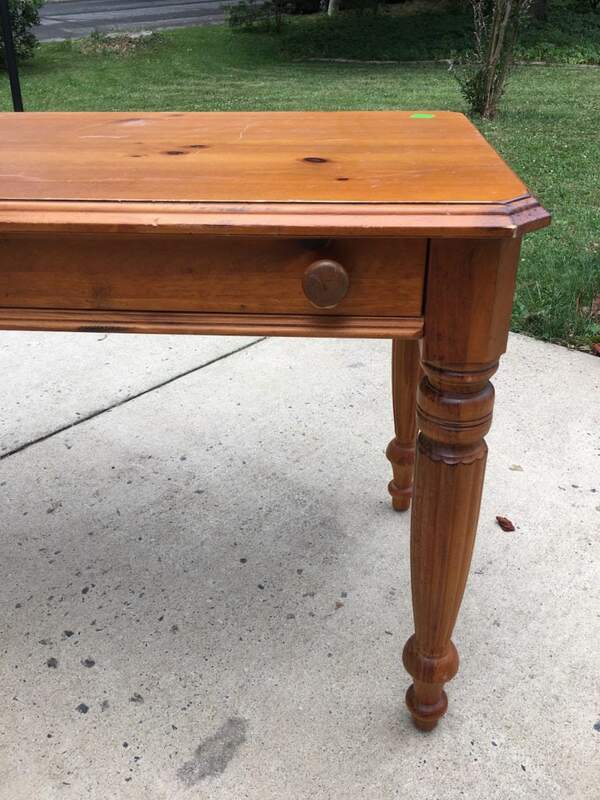 * The grain on the drawer is gorgeous, and from the ‘Before,’ I would never have dreamed it could be resuscitated back to its original glory– great work! Serena, have you considered painting the legs of your desk, but sanding down and restaining the top? I’m finding I quite like the look of partly painted, partly stained wood pieces lately. The Lego-bin idea was so good, I’d run back and see if that other sewing chest was still available. Gah, those bricks wind up *every* where, don’t they? That display coffee table, now THAT was the deal of the day, and that tall glass display cabinet looks great now, and I’m sure it’ll look even better in it’s new darker finish soon. 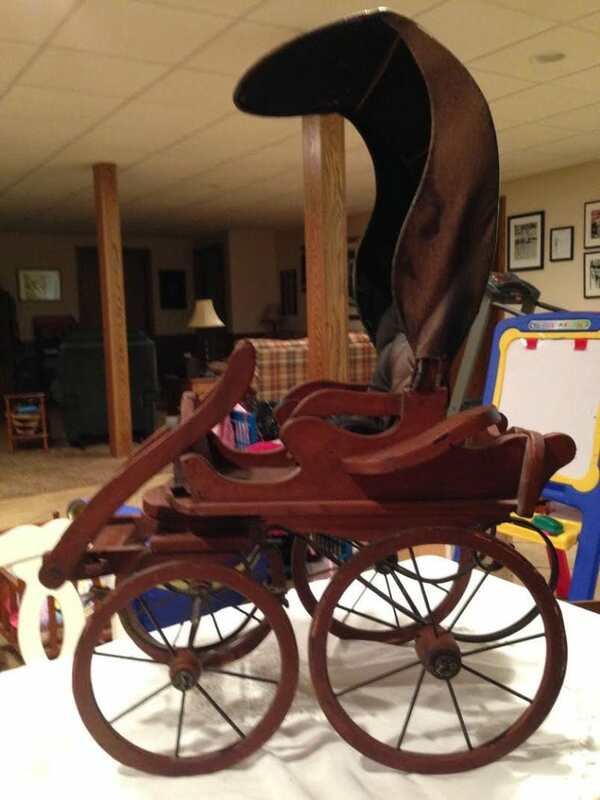 The Amish buggy model is just as cute as it can be. It’s great that is has a home now where it can be lovingly displayed. 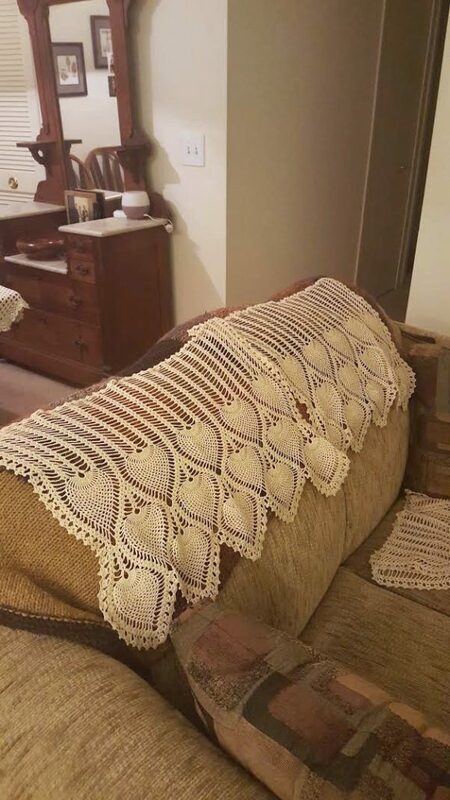 Heh, I’ve hung doilies as curtains, myself! They make interesting shadows, for sure. Those garbage can panels were a steal, and wow, they look like a party all by themselves! Just seeing the picture makes me want to go out and enjoy that yard. The mid-modern-mod streak in me wants to wire those pretty lacy metal hangers to hold a pendant Edison bulb, suspending them with chain for that retro swag-light look. *Giggle* I can’t decide if those hand pushpins are awesome or a wee bit creepy, or both, which is sometimes even more fun! This sneak peek celebration is so good, I’m *really* looking forward to seeing what tomorrow brings! Thanks for sharing your treasures, everyone! 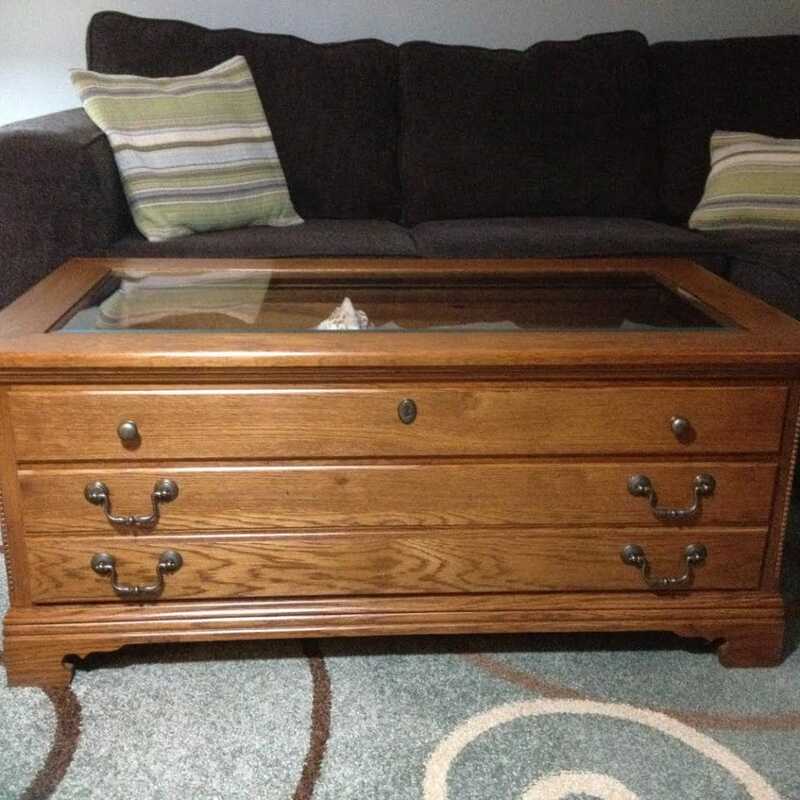 You lucky people who live in civilization….where people send nice stuff to thrift stores that charge enough to make the furniture do-able. But since it’s national thrift store day tomorrow (who that that one up????!!!!) 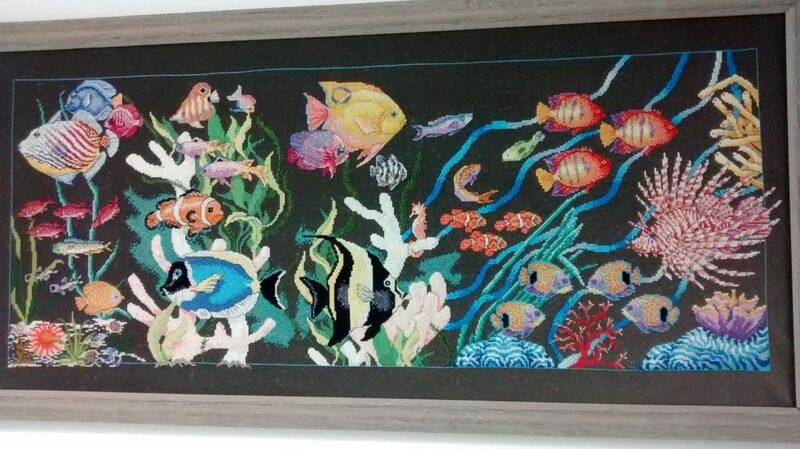 I’ll go look one more time…..sigh,,….I would love to have that fish needlepoint. It’s truly a winner for someone who loves color (me!). I try not to be jealous…..(deeper sigh)……. Serena, I love this new “sharing” project! So inspirational! I loved the desk you showed, the “ugly” desk transformation, the gray bench and the sewing boxes, in particular. All pieces/ideas that I could use (want). The other projects were great ideas–just not as relevant to me personally at this stage in time. I’m still needing to move; haven’t found the right place yet, as housing here is extremely limited, but it will happen in due time. 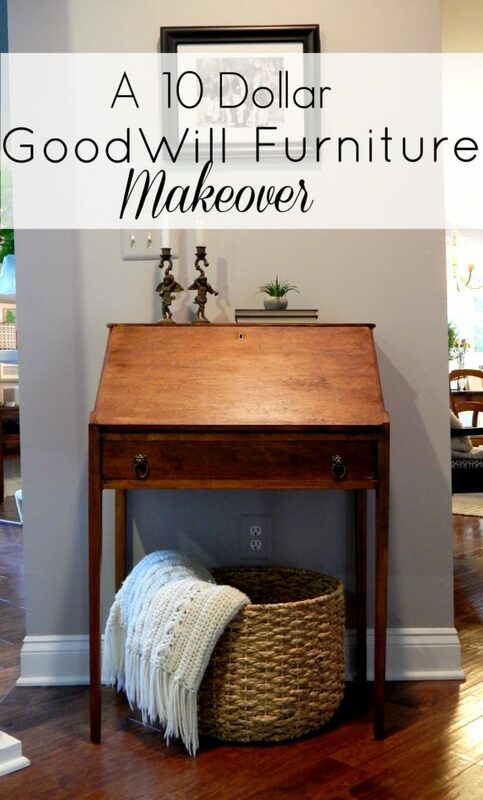 As for your desk, that is one project that would be worth the effort it takes to refinish. It”s just beautiful! Steel wool, cotton swabs, emery boards and chop sticks would all be useful in working those nooks and crannies. Stain would give it a depth that paint wouldn’t, in my humble opinion. I got so much inspiration from this post and it’s only the first in this series. You and your readers rock!